Stirling engines are classed as external combustion engines. They are sealed systems with an inert working fluid, usually either helium or hydrogen. They are generally found in small sizes (1 - 25 kW) and are currently being produced in small quantities for specialized applications. 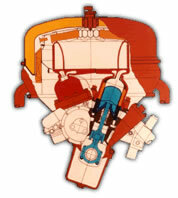 Stirling-cycle engines were patented in 1816 and were commonly used prior to World War I. They were popular because they had a better safety recordthan steam engines and used air as the working medium (rather than steam). As steam engines improved and the competing compact Otto cycle engine was invented, Stirling engines lost favor. Recent interest in DER (Distributed Energy Resources), used by the space and marine industries, has revived interest in Stirling engines and as a result, research and development efforts have increased. The mission of the ARES program (sponsored by the Department of Energy) is to lead a national effort to design, develop, test and demonstrate a new generation of reciprocating engine systems that are cleaner, more reliable, and more efficient than products that are commercially available today. High Efficiency - The target for fuel-to-electricity (low heating value) is 50% by 2010. Environment - Engine improvements in efficiency, combustion, strategy and emissions reduction will substantially reduce overall emission to the environment. The NOx target for the Advanced Natural Gas Reciprocating Engine is 0.1g/hp-hr (0.134 g/kwh). Fuel Flexibility - In the future, natural gas-fired engines are to be adaptable to firingwith dual fuel capabilities. Cost of Power - The target for total energy costs, including operating and maintenance costs, is 10% less than current state-of-the-art engine systems while meeting projected environmental requirements. Availability, Reliability, and Maintainablity - The goal is to maintain levels equivalent to current state-of-the-art systems.